Anyone who ever says that UK diving is boring, silty and cold has never explored our wonderous waters. We love British diving and we run a number of trips throughout the year to some amazing places. Use the skills you learned during your training, and join us at one of our favourite destinations: Cornwall, Devon, Hampshire and Norfolk. 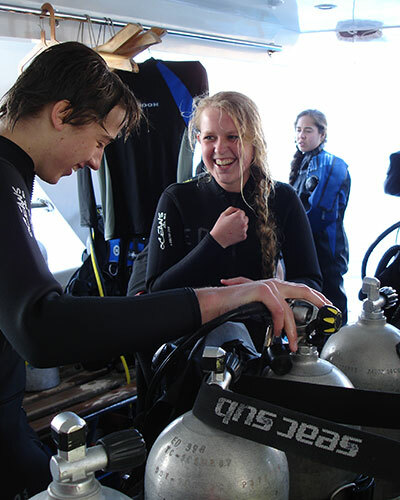 Our diving adventures are led by experienced instructors, making this a great way to explore historic wrecks, see incredible marine life or cruise over beautiful reefs hidden below the waterline. We love playing with seals, spotting a cheeky tompot blenny and watching a fiesty velvet crab. We are a SSI and PADI dive shop and First Aid at work facility offering open water courses, PADI advanced open water dive courses, PADI rescue diver courses and speciality courses in deep diving, wreck diving, nitrox, photography, drysuit diving and over 20 more PADI courses. I didn't learn to dive with you, can I go diving with you? Yes of course you can. It doesn't matter who you trained with - BSAC, PADI, RAID, SSI, SAA, etc - we are all divers. Several local dive clubs use us for air fills, to buy equipment or to have kit serviced. My last dive was more than six months ago, can I book onto a trip? It may be necessary for you to complete a Scuba Review with us so that you can familiarise yourself with your equipment and skills and enjoy your dive.